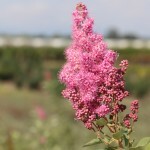 A suckering shrub, native to the western states. 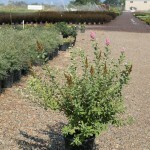 Flowers are 8" long clusters of pale to dark pink blooms in mid-summer. It grows in marshes, swamps, bogs, damp meadows and along streams. It prefers full sun to part shade and needs consistent moisture. If needed, prune back hard after flowering to rejuvenate the plant. Usually used in naturalized settings.